We hope you will enjoy this month's articles. or contact us by clicking here. CHECK OUT OUR CARPET CLEANING ARTICLES here and here. 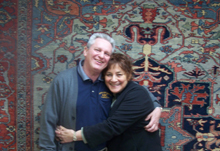 CHECK OUT OUR ARTICLES ON ORIENTAL & AREA RUG CLEANING Articles here and here. CHECK OUT OUR ARTICLES ON TILE & GROUT CLEANING Articles here. Services paid with cash qualify for an EXTRA 5% off. CALL ABC at 607-272-1566 for more information and more discounts! Discounts applied to services MUST be above our minimum charges and CANNOT be combined with other discounts. Services must be performed in the month they are offered only. ABC has donated $500 TO ONE TREE PLANTED for the 4th Quarter of 2018!! We are having 500 trees planted in California! As Per your input, we will continue to plant trees in California for the 1st QUARTER OF 2019!! Moghan oriental rugs were produced in an area of what is now Azerbaijian, a former Soviet Republic which gained its independence from Russia in 1991. It is located in the Caucasus and the Trans-Caucasian mountain region just above Northwestern Iran. Rugs from the Moghan area were one of the more important of the Southern Caucasian rugs. Also included in this group were the Kazak, Karabagh, Gendje, Talish, and Shirvan. Of the above-mentioned rugs, The Karabagh more closely resembled Persian rugs and tended to have finer patterns. The Moghan rugs, on the other hand, had more in common with Caucasian rather than Persian rugs. It can be said the stormy, bloody history of the Caucasus region, with its ethnic, cultural, and religious strife combined with seemingly endless invasions by so many different peoples (Arabs, Persians, Russians, Mongols, Tartars, and Turks), is reflected in the bold colors and designs used in their weaving. Over the last 1000 years, Caucasian weaving went through a transition from sophisticated court rugs of the 17th century to the the unique 'folk art' tradition of weaving that evolved in the early 19th century. 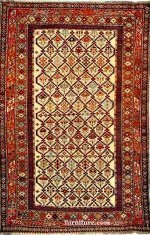 The construction of these rugs and those from most of the Caucasus region consisted of a foundation (warps and wefts) of hand spun wool, although occasionally some of the older rugs and more so the newer ones featured cotton foundations. The warp (up and down threads) are usually made of undyed light yarn in one area, and dark or mixed yarn in another. The wefts (side to side) yarns were usually different colors such as rusty red/brown, blue or white. Goat hair was sometimes used for the warp threads, never the pile. The knots were the Turkish (symmetrical or Giordes). The old weaving districts such as the Kazak, Shirvan, Moghan, Dahgestan, and Derband that existed before Soviet rule either do not exist or are no longer associated with the rugs marketed in their names. For example, a Moghan or a Shirvan woven today could have been made in the areas of of Moghan or Shirvan. It is also very difficult to be exact about the origins of the antique rugs of the Caucasus since rugs from one area were often marketed as coming from another and sometimes the names were combined, such as a Moghan Kazak. It is, however, sometimes possible to identify the area of origin by the numbers and colors of the selvages (edges). To find out the design of Antique Moghan Oriental Rugs including photos, please continue reading here. Coir natural fiber (pronounced COY-er) is familiar to most of us as the material used to construct coarse, wiry outside doormats as well as the coarse fiber liners found in hanging flower baskets. Coconut Palm trees flower monthly and it takes a year for each resulting fruit to ripen. Therefore, one tree always contains fruits at 12 stages of maturity. The fruits are harvested approximately every 45-60 days. They can be picked up off the ground if they have ripened and fallen or climbers may pick the fruit still on the tree. In some areas, monkeys are taught to climb the trees and help with the harvest of the coconuts. Each tree can yield 50 to 100 coconuts a year. The fruit of the coconut palm is exceptionally hardy. The tree itself is very useful, providing not only food and fibers, but drink, fuel, and building materials. Coconut palms abound in the tropical regions of the world, although commercially produced coir comes mostly from India and Sri Lanka. Coconut palms originated in Southeast Asia and are grown in more than 93 countries in the world today. They are one of the oldest plant families and have been cultivated for around 4,000 years. In Micronesia and Polynesia, coir was called sennit and sennit roping was the main way to connect pieces in the construction of boats, weapons, buildings, and tools until the introduction of iron nails from European explorers in the late 18th century. Today, coir is also economically important in Brazil, Indonesia, the Philippines, Vietnam, Mexico, and the Ivory Coast among others. Ripe coconuts are husked immediately. Unripe coconuts are often seasoned for a month. They are spread out on the ground in a single layer to keep them dry. If manual labor is used, in order to remove the coir fiber, the coconut will be placed on a steel spike to split the husk and then the pulp layer can be easily peeled off. If modern husking machines are used, they can split and peel about 2000 coconuts per hour! Retting is the curing process. Defibering involves separating the fibers from the pith and the outer skin. Finishing follows last in the process of producing coir natural fiber. Depending on the type of fiber to be processed, the curing or retting stage of coir natural fiber production results in significant water pollution, though research has begun to find ways to treat this problem. If the fibers are extracted from fully ripened coconuts, they yield brown coir, which is strong and highly resistant to abrasion. This dark brown coir is the one used mostly in floor mats, brushes, sacks, and upholstery padding. Fresh water is used to process brown coir. It is stronger than flax and cotton but not as flexible because it contains more lignin and less cellulose. It is unsuitable for dyeing as well. If the fiber is extracted from the husks of coconuts shortly before they ripen, it is light brown or white in color, is softer and finer, but is not as strong as the brown coir. This type of coir is usually spun into yarn and woven into floor mats or twisted into rope or twine. Sea water and fresh water are both used to process white coir. Fiber length is also important in coir natural fiber processing. Both the brown and white types of coir fibers range in length from 4 to 12 inches. Bristle fibers must be at least 8 inches long. Mattress fibers, which are finer in texture, are the shorter fibers. A 10 oz. coconut yields about 1/3 bristle fiber and 2/3 mattress fiber. Find out about the advantages of coir natural fibers and more by continuing to read here. Portable device pains can become an issue for those of us who have accepted the awesome technology of cellphones, tablets, and laptops as part and parcel of our everyday lives. As we become more and more dependent on these devices, we may begin to experience a phenomenon we will call portable device pains. The technology is relatively new and admittedly addictive. We may not realize all that hunching (and other bad postures) to look at these devices for extended periods of time can put serious strain not just on our necks and shoulders, but also on our upper and lower backs, and arms and hands as well. What can we do about portable device pains? We must first recognize that damage can occur and then devise ways to help minimize or relieve the damage. So many of us look down at smartphones throughout the day, some for hours -- and this head position is damaging our spines. The human head weighs about 12 pounds and when the neck bends forward and down, it adds weight to the cervical spine. When our head is bent at a 60-degree angle to look down, that added weight can equal as much as 60 pounds (about 4 bowling balls)! The result? Neck pain or Text neck. The catchy name refers to a variety of ailments arising from this poor posture, including neck pain, shoulder pain, headaches, upper back pain, and more. Keeping your head down this way can also speed up the degeneration of your spine. Bring your phone up high enough so you can look down at your screen with just your eyes. Turn your head to the left and to the right. Yoga poses. For ex., downward-facing dog or cat-cow, where you get down on all fours alternating between straightening and rounding the spine. Pain from this bad posture position can happen if you prefer to sit looking down at your laptop or tablet on your lap. This rounds your back and can cause the disks in your lower back to bulge backward which could lead to problems such as a herniated disk. You can place a pillow on your lap in a pinch. But it would be best to move your laptop or tablet to a table where you can find a comfortable position for your spine. When you sit on a bed with bent knees and a portable device on your thighs or on the bed with your head thrust forward to look at the screen, you are causing damage to your head and neck by flexing them too much. Lie on your side while holding the device steady with one hand. Remember to switch sides and hands every few minutes, if possible. For an explanation of this pain and others and more information about portable device pains, please continue reading here. Like us on Facebook and receive a $10 Credit off your next cleaning. THANK YOU!! WE LOOK FORWARD TO CONTINUING TO SERVE YOUR TEXTILE CLEANING AND REPAIR NEEDS! Get our monthly newsletter, just like this one, delivered right to your inbox each day. Just sign up and we will send you the best new articles and videos as they become available. Your email address will NEVER be spammed, sold, or shared. You are welcome to unsubscribe at any time with the link in the email. Learn how to remove spots with ordinary household solutions. Sign up below to gain access to your complementary Spotting Guide from ABC. Registering your email address guarantees you will be notified whenever discount savings coupons become available. 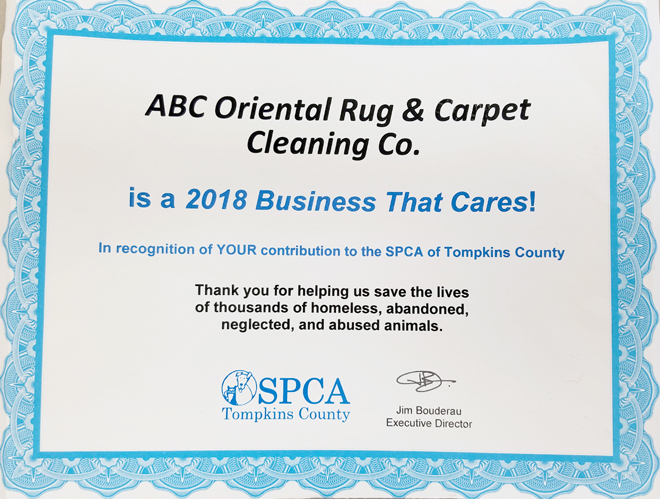 ABC Oriental Rug & Carpet Cleaning Co. has been family-owned and operated in Ithaca and surrounding areas for more than 48 years. Our company is a reflection of our family name and pride. for more information and to find out what we are doing at our business and in the community!